Sigi Schmid: We’re just happy to be in the Open Cup final again. It’s a tournament that, as a club, we take very seriously; if you look at our past history, I think that reflects that. We were disappointed last year by getting knocked out early. But we’re very excited, we’re happy ti be playing against a team that’s playing really well right now in Philadelphia. It’s going to be a tough game. It’s going to be a competitive game, a fun one to watch, and a good game. Hopefully all the fans will come out and watch the game and we’ll have a good time out there. Jim Curtin: It’s an exciting time in Philadelphia. We have a chance to lift our first trophy. Playing against a team that’s the best team in MLS right now, like I’ve said all week, is going to be a challenge, a challenge that I think our guys will be up to. We’ve had the mantra that we respect everyone but we don’t fear anyone. So, as dangerous as [Seattle] are in attack our guys, I think, will be ready to go. Again, an exciting time in our city, and a chance for the first trophy, which is a difficult one. The man to the left of me has won everything already — I’m new to this game — Sigi I have a great deal of respect for, a coach that I’ve played many times against, and one that is a real winner, one that as a young coach I aspire to be like. So, exciting time for the Union, for our fans — our first final. We’ll see how it goes. To Jim Curtin: Your first game as a coach was in the US Open Cup game against Harrisburg where the team was one minute from being eliminated. Talk about what the team has been through to get this far. In these competitions — and Sigi can speak for this — there’s always obstacles, big hurdles that you have to go through. Early on against a — they call them lower division teams — they’re challenging games because it means so much to them to get a result. So, we battled through the first two of them with Harrisburg and then the Cosmos. Our biggest hurdle was obviously in Dallas; it was the most difficult game we had because we had to go on the road. Another factor is the home field; it’s a good thing to have the final on your home field, a good advantage for us. It’s a competition I’m very familiar with, the grind of it. The fact that the games come midweek and they come at you fast is a challenging one, you have to juggle lineups, you have to juggle different things. But, to be able to have our team rested right now and put a full strength squad out there on Tuesday is very good for us. I’ve just been the one time in the final with Sigi five years ago, and we won it, so it was a good memory. Before, I went twice to the semifinals with [the Sounders when they were in the USL] but we never reached the final. It’s a competition that’s very important to win; it’s the second trophy you can win in America, so I feel lucky to be able to be again in a final five years ago. I just hope to win it again. It will be difficult but we’ll try be ready for that tomorrow. Personally speaking, it means a lot to be in the final, to represent Seattle, a team that’s been so successful in the tournament. Like Sigi said, it means a lot to the club, and it’s an important tournament to the club. For me personally, to be a part of a competition that has Lamar Hunt’s name on the trophy is very special. Lamar brought my father here to the States back in the ’70s [to play for the NASL’s Dallas Tornado] and he played his entire career for Lamar. When I first started in this league I played under Lamar and then had the opportunity to play for his son, so It would very special for me to lift that trophy. Hopefully, I’ll get that chance. Playing in the CONCACAF Champions League is one of the rewards for winning the US Open Cup. Talk about what that would mean. Sigi Schmid: The Champions League is a competition we’ve been in in the past. We enjoy that competition and look forward to it. Getting knocked out in the semis the last time around gave us a taste of how close we could get to the final game. Being able to eliminate a team form Mexico was something that was really special at the time. But, that’s far in the future, what’s at hand is a tough game tomorrow night. We have to be prepared, we have to be fully focused and concentrated because Philly’s a good team. To Sigi Schmid: Has there been any thought of resting players because of your MLS commitments? I think you look at each game a little bit differently and how you’re going to approach it with your team. Players like to play, they don’t like to train and they don’t want to be rested, necessarily. So we look at it: is somebody carrying a knock; is there an injury or some reason that we don’t think he can get through 90 minutes — then we might make some adjustments or some changes. But we feel that with the amount of rest that we’ve had from our game on Friday we feel pretty good about the group. It was an important game for us on Friday. We played our first team pretty much in that game, and we’ll see how it goes for this one. We haven’t made final decisions, there’s probably three of four things that are up in the air for us right now, and we’ll decide those tomorrow morning as to how we’re going to proceed. We want to approach every game just as Jim did: You approach every game to win it. Sometimes that means you make some lineup changes, sometimes that means you don’t. To Jim Curtin: You’re from Philadelphia and you know that there haven’t been a lot of championships in recent decades. Do you have a sense of how the city might respond if a young franchise like the Union win can win its first trophy? I’ve been through the highs and lows, the runs of emotion with a Philadelphia sports team, what it means to be a Flyers, a Sixers, a Phillies, an Eagles fan. We have our own unique fan base and they’re hungry. It’s only our fifth year; this is an opportunity to lift a trophy, it’s one that our fans deserve. I think we have the best fans in the league, I think they deserve a trophy, and I think they’re excited. I think they’ll all be out here in waves tomorrow and pushing us on. You know, it’s something that means a lot to me. Being from this city, to do it here would be special. It’s different than as a player. I’ve won this competition twice as a player and I lost it once as a player. But as a coach, it carries a little more weight. I think as a player you’re a little more selfish maybe in your thinking in that it’s for the team and the individual — sure, it’s for the city as well — but being from here I feel a little bit more the weight not to let the city down. And we want to win. That’s kind of the idea that I’ve preached, trying to win. From the start here, I thought our roster was good enough to win, and we’ve proven that lately. Now, this is another game that we go into where the only thing to do is to win. To Jim Curtin: With the emotions running so high, are you concerned about the first ten of fifteen ,minutes of the game? Yeah, finals are unique, they’re always crazy. You play in them and sometimes the teams don’t look like they do in the build up to a final. It can be crazy at the start, there can be some long balls — it’s a feeling out process — because there’s nerves with any player. You’re a liar if you say you aren’t nervous going into a final, as a coach and a player. So, it’ll be an emotional start to the game, but once it settles down, both teams can play. We can counterattack wit the best of them; they have a heck of a counterattack as well, and they can keep the ball with any team in MLS. It’s going to be a bit of a cat and mouse early on for sure to feel each other out, but once it settles down it is a game in which you have to teams that are in very good form, and the soccer part takes over at that stage. To Sebastien Le Toux and Kenny Cooper: You have known each other for some time and you’re also No. 1 and No. 2 on the scoring list for the modern era of the US Open Cup. Sebastien Le Toux: It’s nice that, as brothers, we are first and one in leading the score, it’s nice that it stays in the family. It’s great [laughter begins] — yeah, we are [brothers], I don’t know who the dad is, we have to check. I think it is great. Most people, I know for both of us, I know [for] Kenny, we want to help your team win and to be in the final. The fact that we are both leading scorers, it’s a nice thing but it’s not what we want. We are looking both at the trophy right now and we want to get it no matter what. We have a lot of respect for each other, and a lot of respect for both of our teams. At the end we are going to be I think happy for the one to win but very disappointed if we don’t get it. I’m just looking at [the trophy] and hope that we are going to raise it tomorrow, and I’m sure that he wants the same. Kenny Cooper: Yeah, it’s the same sentiments. I think both of us would rather lift that trophy than be the leading goalscorer. Seba’s been doing great this year. I consider him a friend, we go back a long time — to birth [laughter]. No, we met each other a long time ago in Dallas and had the opportunity to play with each other in New York a couple of years ago. He’s a great guy and a great player, and I’m happy for his success and for the great form that he’s in right now. But, again, I think both of us would rather lift that trophy than be the leading goalscorer in the competition. Sebatien Le Toux: I want him to score two goals but we win, 3-2. So, e pass in front of me [on the goalscorers list] and we win. Yes. Any injuries to report, is everyone healthy? Jim Curtin: We’re as healthy as we’ve been, it’s a credit to our medical staff. Paulie, Steve, and Kevin Miller have done a great job getting our guys ready through a tough run of games where we’re playing Saturday-Wednesday-Saturday. They’re all playoff-type games, they have all had a playoff-type feel just because we have no margin for error. I think that helps also, going into a final, that we’ve played in pressure-type games now for what feels like three months. We have no margin to drop any points, so, positive. Sigi Schmid: We’re as healthy as we’ve been all season also, so, it’s just a matter of making some decisions. But, form a standpoint of our team and our health, it’s in good shape right now. In Curtin and LeToux this club could have no better spokesmen. That’s a good group of guys to have in a press conference. I know athletes say this sort of stuff all the time because it’s the right thing to do, but I get the feeling that those 4 men genuinely respect their opposition and the game. Certainly 2 groups that go about it the right way. +1 totally agree, Mike. Jimmy manages respect and resolve in such a fine way. Hire Curtin already. And is there a better all-around guy in Philly sports than Le Toux? What a picture. 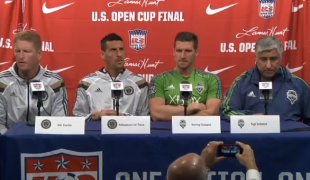 Sigi looks asleep, Cooper looks disinterested, Seba looks distracted by something on the ceiling and Curtin looks like he’s trying to remember if he left the stove on. Classic. Tonight is gonna be so much fun!